First off, the full content of the Washington Post is free for the first six months, $4 a month after that. That’s because Jeff Bezos, the CEO of Amazon, recently bought the Post, so he can offer any deal he wants. A catchy headline from the newspaper on the main screen of the tablet lures you in. This is totally addictive: Joy hasn’t gone a day yet without reading the Post’s featured story. Amazon claims there are more than $10,000 worth of apps and games on the Kindle, ready to click as soon as you turn it on. A lot of these include extra weapons and character enhancements for role-playing games. But you’ll also find email, lots more games, books, music, photos, movies and the web. It’s all easy to navigate; tap on the circle to get back to the main screen. Tap on a square to close down applications running in the background. This is also a good way to go back to the page you were on before you left. Tapping the square lets you jump back and forth between everything you have open. Amazon’s “Silk” browser is a wonderful way to go through the web. It’s an alternative to Google Chrome, Firefox or whatever you’re now using. While you’re using Silk, tap “Reading Pane” For a pleasant surprise: instead of squinting to read an article on the web, it appears without ads and in larger type. Things that bothered us about the older Fire are no longer a problem. The new one is lighter (just 11 ounces) and comes with a micro SD card slot that can expand the memory to 128 gigabytes. That is a huge amount of storage. You have to pay extra for that, of course, but you can buy a memory add-on from many suppliers. We saw them for $45 to $60. 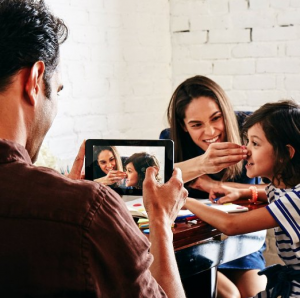 The new Fire tablet handles many more apps than the previous version. For instance, Joy’s favorite, “The Daily Burn,” works nicely on it but didn’t run on the old one. What really blows us away, though, is the price: we paid $50 for all this, and our Apple mini tablet — which we lost — cost us $300.